New York City and stand-up comedy are inextricably linked, like two dysfunctional conjoined twins that share one very hard-working liver. Stand-up exists outside of New York, of course, most obviously in Los Angeles and Chicago, but there seems to be something romantic about squeezing in a comedy show in between a rat-pigeon fight and a 20 minute train delay. It just feels right. Los Angeles and Chicago both have excellent scenes, with excellent comics, but for my money (which is not actually that much money) there is no place with the breadth and quantity of stand-up shows as the ol’ Concrete Jungle Where Dreams Are Made Of. Which presents a new problem, especially with the Second Comedy Boom™ exploding all around us. Which of these shows are actually good? Great stand-up can change your perspective on life, make you laugh, cry, snort embarrassingly, all at the same time. Bad stand-up has the power to stretch 10 minutes into seemingly 14 hours. Thankfully, you have a guide. Me! I’m a stand-up myself, and if there’s one thing comics are good at, outside of performing and redeeming drink tickets, it’s being loudly opinionated about what stand-up is and isn’t good. That said, when Paste gave me the opportunity to push these thoughts on their readership, I said “Absolutely!” Then, I typed the word “absolutely” and e-mailed it to them, because they couldn’t hear me. But let’s get to it! Time for me to tell you how to live your life! Much like dead skin cells, weekly stand-up shows are surrounding you at all times, whether you know it or not. Is there a bar near you with any sort of event space? I’d bet you upwards of 23 cents that there’s a comedy show there at least one night a week. Here, however, are some of the city’s best. 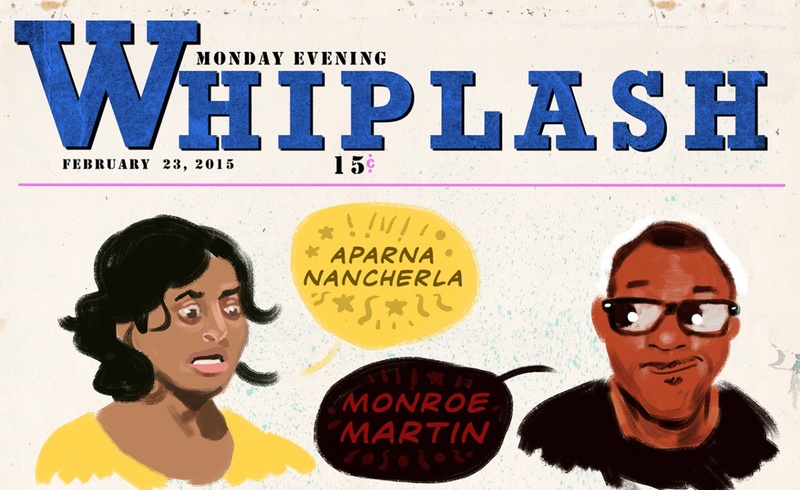 WHIPLASH: Whiplash is likely the best free show in New York City. The show, hosted in its current iteration by masterful observer Aparna Nancherla (Conan, Totally Biased and more) presents a handful of carefully picked and relentlessly funny stand-ups, from rising stars in the New York scene to household names. You may catch a drop-in from Louis CK or Amy Schumer, but you might just discover your new favorite comic at the same time. Just make sure to reserve tickets ahead of time and get there early for a seat. BROKEN COMEDY: Mike Denny, Nimesh Patel and Michael Che host this weekly show in the back room of Greenpoint boozehound stand-by, Bar Matchless. The laid-back vibe here is closer to A Tribe Called Quest than vaudeville, and the hosts are more likely to lightly riff with each other and the audience while sipping drinks up top than they are to scream at you “HOW ARE YOU DOING TONIGHT? BY A SHOW OF HANDS! PLEASE GOD, TELL ME!” The line-ups, however, are anything but casual. NIGHT TRAIN: Whether this show is named for the fortified wine beloved by cartoonish bums, I do not know. But the quality of the show is something I know definitively to be invariably solid. Hosted by Daily Show alum Wyatt Cenac at Gowanus performance space Littlefield, Night Train boasts some of the most impressive line-ups you can catch for $5 anywhere in the country. The bar also has a surprising selection of sake, in case you want to try out a whole new type of hangover Tuesday morning. HOT SOUP: Tuesday’s the new Thursday, and Thursday’s the new Friday, and Friday and Saturday are lame now. Didn’t you hear? One good option is Hot Soup at Irish Exit every Tuesday night. Hosted by NYC stalwarts Gary Vider, Matt Ruby and Mark Normand, and produced by Jeremy Levenbach, who also produces the aforementioned Whiplash, this show features… more great line-ups. All these shows have great line-ups. Why would I tell you to go to a show without a great line-up? It’s sort of why I made this list. Yeesh. Anyways, it’s free, but if your Tuesday was especially grating, you have the option of a $20 open bar from 8-10 PM. Or even if your Tuesday wasn’t that grating. I’m not your mom, make your own choices. CAKE SHOP: A rotating quartet of hosts including Sabrina Jalees, Jacqueline Novak, John Early and Liza Treyger (all hilarious comics in their own right) hold your hand and lead you slowly into a deep stream of laughter at this show, produced by Sam Varela. In the basement of LES drinking hole and music venue Cake Shop, you’ll catch a variety of performers from deadpan observational masters to theatrical absurdists. Or, to be less grandiose: A bunch of funny people, y’all. A vending machine also dispenses Hall & Oates pins for fifty cents, which I feel is very important information. THE FANCY SHOW: For the Park Slopian comedy fan, drop by Bar Reis’ downstairs bar to catch the Fancy Show, which is as laid-back as it is high-quality. Hosted by Langston Kerman, Michael Joyce and Lane Pieschel, the comics are funny, the vibes are good, and the drinks are relatively cheap. The small room only adds to the atmosphere. GRAND STAND COMEDY: A relative newcomer compared to some of the heavy-hitters on this list, this Williamsburg show nevertheless has been churning out great line-ups week after week in the back of surprisingly fancy bar The Grand. Do you want to eat oysters while watching comedy? This may be one of the few places to do so. Recently handed off from original host and producer Adam Palmeter to new hosts, delightful bespectacled Brit Tom Cowell and constantly churning comedic mind Kyle Ayers, this show is a fun night in the back of a bar, where you’re likely to see all the comics that’ll be all over your television in a couple years. GANDHI, IS THAT YOU? : Lance Weiss and Brendan Fitzgibbons run this show at LES bar Lucky Jack’s every Wednesday. Boasting another impressive history of drop-ins, including Jim Gaffigan, Broad City’s Ilana Glazer and Louis CK, you’re going to see a lot of amazing comedians, and you’re going to pay zero dollars admission, and that’s a pretty great deal. THE FRONT ROOM AT KNITTING FACTORY: The baby bear to the momma bear that is the Sunday night shows at the Knitting Factory. Rotating hosts Ryan Beck, Joyelle Johnson, Anthony P. DeVito and Megan Gailey front this show, produced by Knitting Factory comedy impresario Luisa Díez (you’ll spot her pulling the strings at every show, just look for a shock of red lipstick under some bold-framed glasses). It showcases a mix of comics famous and almost-famous, with a little more breathing room than the Sunday shows. If you’re already a regular at the Sunday shows, come by on Wednesday for a second taste of who Luisa thinks you should be watching. She’s usually right. 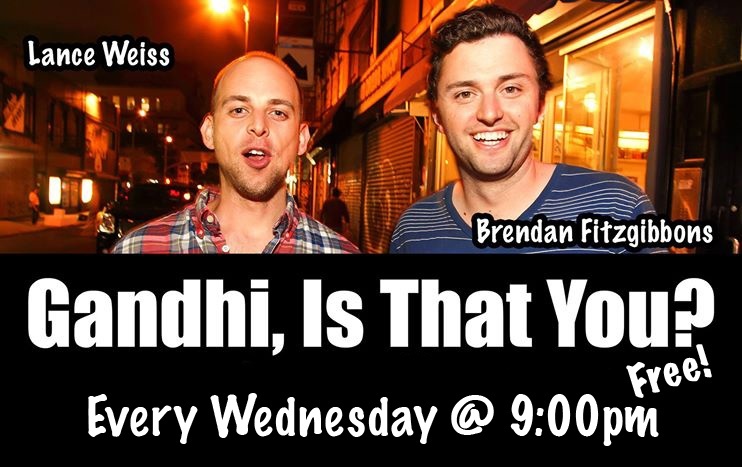 THE GUEST ROOM: If you’re interested in finding new comedians who are just as funny as the people all over your picture box, come by Tandem bar in Bushwick Wednesday nights to catch this showcase from Lucas Connolly, Bob Palos and Ronnie Fleming. You may not catch Bill Burr dropping in, but you might discover a whole bunch of hilarious comics that have been toiling away at bar shows throughout the city and Brooklyn. There’s also an open mic directly afterwards, if you want to hear the people on the show work out new stuff, or even try it yourself. FUNNY MOMS: If you’re a South Brooklyner, or even if you’re not, check out this show from Adam Friedland and Sara Armour, who moved this show along with them from Washington DC. The show’s held in the back room of Berg’n, a bar slash food vendor space that has pretty much every beer you can imagine as well as food from beloved NY spots such as Mighty Quinn’s. LASERS IN THE JUNGLE: Dan Wilbur, Sean Crespo and Katina Corrao host a grip of comics every week at UCB’s East Village location. 5 dollars gets you admission to see a tight collection of great comics doing their best jokes. If your parents are in town and you think they’re probably not up for sticky floors and wobbly barstools, this show combines the alt comedy the cool kids crave with the theater seating that your pep pep needs for his lumbar. COMEDY AS A SECOND LANGUAGE: This showcase, produced by Creek & the Cave owner Rebecca Trent, has been presenting the best comics in New York for years. It’s now located at Pyramid Club after original location Kabin shuttered, though you’ll likely still hear comics calling it Kabin, which should give you some idea of how ingrained it is in the New York comedy landscape. Hosted by the usually beanied-and-bearded Rojo Perez and “King of Thursday Night” Scotland Green, it’s probably where your comedian friends are hanging out on a given Thursday night. FRESH OUT: And if your pep pep falls asleep at Lasers, don’t worry! Just pick up a ticket for Fresh Out, which follows Lasers in the Jungle, swapping out the previous hosts for Jim Tews and Ashley Brooke Roberts, and catch another show full of great comedy, which has included name-brand comics like John Mulaney, Janeane Garofalo and Zach Galifianakis. And let your papa sleep! He works so hard. 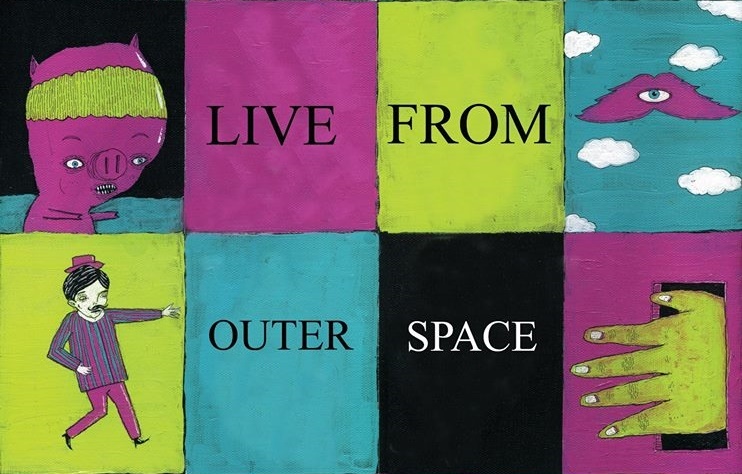 LIVE FROM OUTER SPACE: This Bushwick show, run by trio of delightful weirdos Ben Kronberg, John F. O’Donnell and Erik Bergstrom, takes care of your whole Friday night. The show is always fun, with a line-up of very funny comedians, and afterwards, the room is taken over by the Kings of Karaoke for karaoke that continues into the wee hours. If you get hungry, grab a frito pie at the front bar. SLOW DANCE: Go by Niagara Bar on a Friday evening (look for the giant mural of Joe Strummer) and you’ll find this weekly showcase hosted by Aaron Glaser and Amy Cardinale. Pack yourself into the back room and enjoy some quality stand-up comedy while cool kids wear expensive hats at the bar out front. Plus, there are lots of cute dogs in the adjacent park. That’s a win-win! GOOD FOR YOU! : In the back room of Williamsburg Mexican restaurant Cantina Royal, a delightful stand-up show has cropped up every Saturday night. Hosted by Ian Hunt, they’re bringing some of the funniest comics round into that back room and making good comedy happen, with a DJ playing music afterwards. COMEDY AT THE KNITTING FACTORY: Perhaps Williamsburg’s best-known comedy night, and the last neighborhood stand-up legacy with the departure of Big Terrific. The comedic Cerberus of Clark Jones, Will Miles and Kenny DeForest host this night of comedy, passed on from the now almost ubiquitous Hannibal Buress. The line-ups are some of the best you’ll find in the city, and often, it’s the people NOT on the line-up you want to be there for. Drop-ins include Chris Rock and Dave Chappelle, who I’m going to hope you’ve heard of. Make sure to show up early because this show gets packed. It’s usually free, though occasionally they’ll do big bashes in the back room, which are invariably worth the couple bucks they may cost. IF YOU BUILD IT: UCB East’s Sunday stand-up offering is If You Build It, hosted by Kara Klenk. For 5 measly American greenbacks you’re guaranteed to see a show full of seasoned comics who’ll almost make you forget you have to go back to the office tomorrow, where the only jokes come from Terry at the water cooler. Ugh… Terry. COMEDY AT BEAUTY BAR: Walk down 14th St. between 2nd and 3rd Avenue in Manhattan on a Sunday night and this show will likely find you. Hosts Nate Fridson, Brad Austin and Adam Sokol are likely standing outside, waiting to let passersby know that there’s a comedy show about to occur through some well-placed barbs. Once inside, walk by the manicure table, grab a beer, and head to the back to watch the show. Afterwards, hang around for karaoke so your Monday morning is as painful as possible.